Many people don’t know my background. That’s fine with me. Because with the advent of “The Information Highway,” I’m finding that the more people don’t know about me, the better off I am. And that is what I loved about being on the mountain. I started off in the Blue Ridge area as a young boy in the early 1960s, hiking the Billy Goat Trail in Harpers Ferry, W.Va. That trail is now part of the Appalachian Trial, but then it was just the dirt trail at the end of the steps up to the Jefferson Rock — that then lead to Route 340. Back then 340 was two lanes all the way to Charles Town and beyond. In my youth, the AT ran off the north end of the Loudoun Heights side of the Blue Ridge Mountains (by the current Exxon Station), and crossed the Potomac River over the Route 340 bridge into Maryland to follow the C&O Canal, as it does today. As a young boy, I remember visiting Harpers, and was always attracted to the area and the view of the Blue Ridge. My family came to the Harpers Ferry area many weekends; I remember the joy I felt with the mountain that greeted me. My father had been a golf course superintendent. I remember coming to the hills of West Virginia to visit new areas, developments, and golf courses that were opening in the “outskirts” of the Washington area. On one trip I remember crossing the ridge at Clarke’s Gap on the old Route 9, and entering Jefferson County, W.Va. We visited an Adirondack-style lodge at Shannondale, (now burnt down) and I remember my father discussing the building of the largest man-made lake in West Virginia that was underway then in Shannondale. 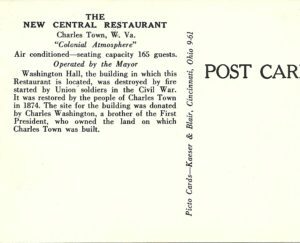 We then went to have dinner at the New Central Restaurant in Charles Town. 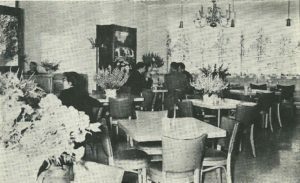 I found an old post card of the place and have scanned an image of it. I returned to the Blue Ridge many times, as often as I could. I was always attracted to the area. I once had a vision during a meditation in which I experienced a previous existence in Harpers Ferry. It was during the Civil War, and I was a cook assigned to the Maryland Heights area. I was involved with a woman nearby. And yes, she had a hooped dress. After I migrated by railroad to West Virginia, spending some time in Martinsburg, I found 5 acres in Jefferson County on the Blue Ridge, just about 1,000 linear feet from the Appalachian Trail. It was all woods, very secluded. I built the biggest log house I could find that was one single structure. Four of us put it up — another mountain resident, two high school kids and I. That’s 550 logs in 16 days, with help from others during two weekends. My neighbors were real mountain people. Many of their families had lived there since the Civil War. Some still had dirt floors covered with old carpet and vinyl in parts of their “house;” they retrieved their water from the spring in Pipertown. All of them were very self-sufficient. “I don’t want your help unless I ask for it. Keep off my land and don’t bother me.” I loved it. As a resident of the Blue Ridge and a landowner on the mountain, I enjoyed the independence that comes with the mountain. I never had frost on my windshields in the morning, nor people wandering into my property. When your driveway is over a tenth of a mile, you will find, nobody will follow it, and nobody will plow the snow. I loved the challenges of living on the mountain. Snow fell on the western ridge when nothing happened below in the valley or the eastern and sunny side of the Blue Ridge. Yup, colder up there in the winter but cooler in the summer. I just loved to sit on my front porch in the summer and watch the thunderstorms come across the Shenandoah Valley. Sometimes they would move south when they met the mountain, sometimes they would move north. But once in a while, they would just plow forward, and the next thing I knew was I was in the clouds! Thunder and lightning like you can’t believe. The whole house would shake. What a thrill; I’m glad my house and I survived. You just can’t imagine a force so great coming over you unless you have been in the middle of the storm, in the clouds, not on the ground. When we had the big snow in February 1983, some 38 inches, I was snowed in for 5 days and my wife was frantic with twin girls, just 3 years old. I worked two days to clear (by hand, remember, over a tenth of a mile) the driveway so we could get out and spend some time with my mom in Rockville, Md. Three days later, it rained and all that was left was a lot of erosion in the driveway — a 6 percent grade and a big storm can do some damage! In May 1998, I walked for 6 days on the Appalachian Trail, southbound from Harpers Ferry to the Shenandoah National Park. I had friends that owned property on the ridge outside of Front Royal Va. I walked alone, and met many “north-bounders” that were thru hiking. I remember my first stop for was at the Blackburn Trail Center, a short side trip to get water. I was greeted by Chris Burton, an an engaging guy with an inquisitive way of conversation that was not intimidating and which led to more conversation. The conversation turned to trail maintenance and an invitation to me to take over the section from Clarks Gap to Harpers Ferry. The area where my log house was. That’s one invitation that I regret I did not follow up on. The mountain has provided me safety, recreation, a place to live, isolation, great neighbors, and a view from above. The mountain provides this opportunity to all only if it is protected and respected.